With the Galaxy S8 and Galaxy S8+ announced, it will become Samsung’s job to make sure that the unveiling of the upcoming Galaxy Note 8 goes as smoothly as possible to avoid another fallout that transpired with the Note7. Coming from Twitter, the alleged hardware specifications of the upcoming phablet have been spotted and it looks there are several ways that Samsung will be looking to one-up over its Galaxy S8 and Galaxy S8+. Mass producing the Snapdragon 845 and incorporating it in the Galaxy Note 8 is not going to be possible, so the company is going to stick to a Snapdragon 835 and Exynos 8895 equivalent model for the Note 8. However, these chipsets are going to be manufactured on the heavily improved 10nm FinFET LPP architecture, adding more performance and enhancing efficiency in the overall equation. Additionally, according to Poyoco Tech, there is a leaked hardware specifications sheet of the Galaxy Note 8, which states that the upcoming phablet will get 6GB of RAM, along with a 64 and 128GB internal storage variant. Unfortunately, what these specifications also state is that the handset will be running Android 7.1 out of the box, and looking at Samsung’s abysmal schedule at releasing official software updates for its flagships, you might have to wait a while to receive Android O for Galaxy Note 8. 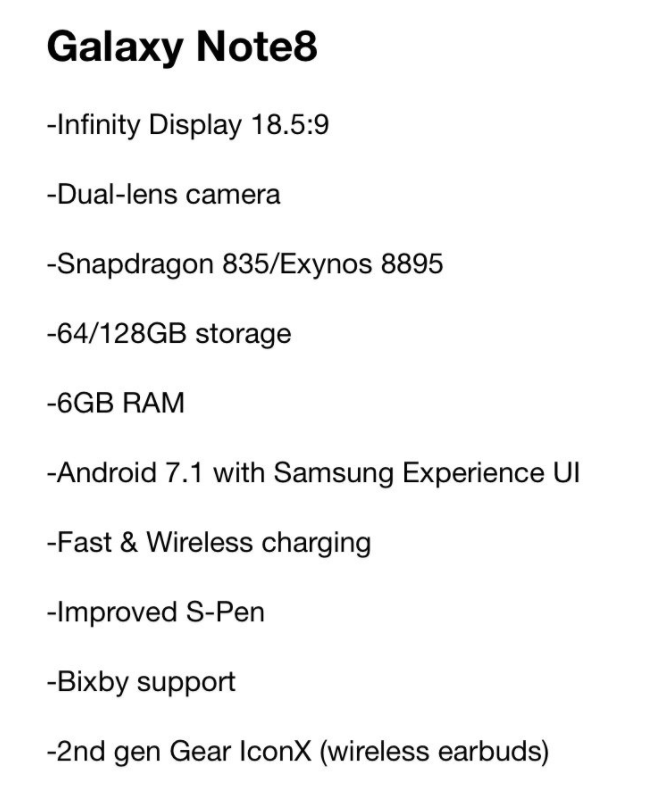 Still, getting to see a dual-camera is what we have always wanted from a 2017 Samsung flagship and this is what the specifications have finally managed to list down. These details also state that the Galaxy Note 8 will retain the 18.5:9 aspect ratio that was present on the Galaxy S8 and Galaxy S8+, but it will feature an improved S-Pen plus Bixby support. There is still a long way for the Galaxy Note 8 to be unveiled, so take this info with a pinch of salt for now. If there was anything that you could change regarding the specification details, what would it be? Tell us your thoughts down in the comments.